Through four innings of Game 1 of the World Series, the Dodgers and Red Sox were in basically the same spot. Boston had a 3-2 lead, but neither team’s ace had taken control of the proceedings, and their impending exits foreshadowed a wide-open final five innings. In the fifth inning, both managers started to make some moves; they all went wrong for Dave Roberts, but very right for Alex Cora. Cora was first to act, pulling starter Chris Sale after he walked Brian Dozier to begin the fifth inning. In came Matt Barnes, who gave up a single to Justin Turner, struck out David Freese, threw a wild pitch, and surrendered the tying run on a Manny Machado groundout. That brought pinch-hitter Cody Bellinger, who slugged .518 against righties in the regular season, off the bench, and everyone waited for Cora to emerge from the dugout to yank Barnes back from the edge. But Cora let his guy pitch, and he was rewarded with a fly out to right. Roberts was presented with a carbon copy of this situation in the bottom half of the inning, yanking Clayton Kershaw after a leadoff walk and a single, and then sticking with reliever Ryan Madson through some hairy at-bats. All he got for his trust in Madson was a 5-3 deficit. Look, sometimes things just work out. Sometimes relievers slip themselves out of jams, sometimes Brock Holt—Brock freakin’ Holt!—hits for the cycle in the ALDS, and sometimes the noodle-bat on your bench breaks a game open with a three-run bomb. Call it luck if you want, but when fans and media spend so much time crapping on managers for making decisions that blow up in their faces, the guys who manage to snip all the right wires deserve some praise. 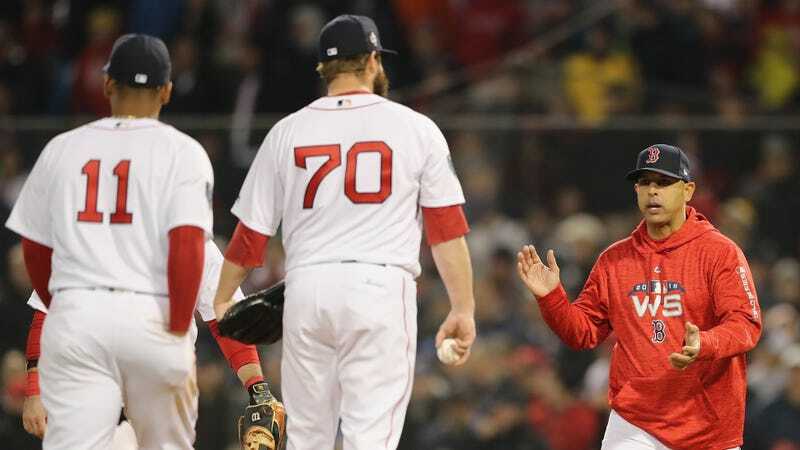 Baseball is a mean game that tends to punish more than it rewards, but Cora and the Red Sox are in a sweet spot right now. This is a team that’s already good enough to win in the midst of strategic turbulence, and they look damn near unbeatable when everything is running smoothly. The easy ride can’t last forever, but three more games of it could make the Red Sox world champions.